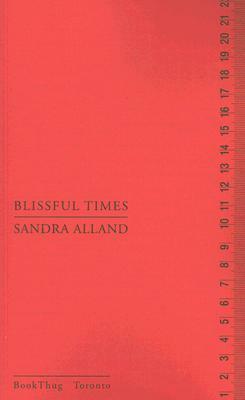 Sandra Alland - Sandra Alland is an Edinburgh-based Scottish-Canadian writer, interdisciplinary artist, small press publisher, performer and filmmaker.Sandra Alland grew up in Scarborough, a suburb of Toronto, Canada. She was raised by a Scottish migrant father and grandfather, and a mother of French-Canadian descent. Alland completed undergraduate studies in Drama at the University of Toronto, graduating with high distinction in 2000.Alland began publishing and performing her work in Toronto in 1995. From 1995-1997, she was part of the performance poetry band, Stumblin' Tongues, with Bermudian poet Andra Simons and musicians Garth and Grant Kien. Alland worked extensively in Toronto's theatre, literary and visual art communities until she relocated to Scotland in 2007. Alland has published two collections of poetry, Proof of a Tongue (McGilligan Books, 2004) and Blissful Times (BookThug, 2007). In 2009, Edinburgh's Forest Publications published a chapbook of her short stories, Here's to Wang. Her chapbook of poetry, Naturally Speaking, a meditation on disability poetics and gender, was published in 2012 by Toronto's espresso and co-won the 2013 bpNichol Chapbook Award. Alland's work focuses on social justice, language, humour and experimental forms.Besides text, Alland works in multimedia, film, performance poetry and sound poetry. She currently collaborates with the Scottish interdisciplinary group, They They Theys, who received 5 stars from Scotland's The Skinny in March 2014. From 2007-2012 Alland collaborated with the poetry-music-video fusion group, Zorras. In autumn 2009, Scotland's ultimatemetal said of her work: "A very unique mix of poetry, music, stories and just plain weird. The poetry was sharp and funny, the placement effective, the visuals fitting; a rather unforgettable experience."